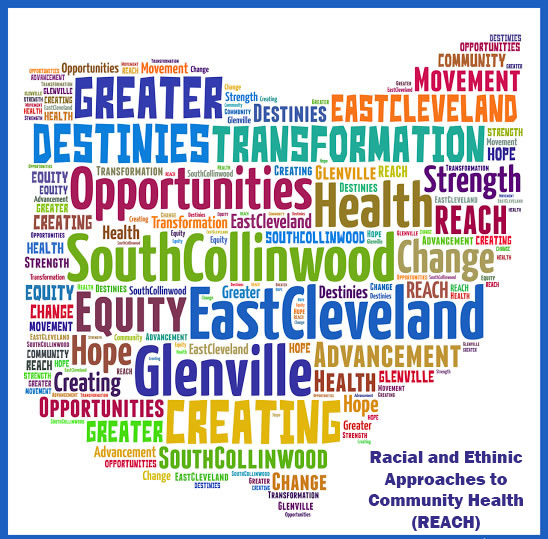 REACH is a series of community initiatives focused exclusively on racial and ethnic approaches to alleviating health disparities in Cuyahoga County. These initiatives come under the umbrella of Health Improvement Partnership (HIP)-Cuyahoga, a consortium of more than 100 organizations working to enhance the health of everyone who calls Cuyahoga County home. HIP-Cuyahoga has four key priorities; eliminating structural racism, healthy eating and active living (HEAL), clinical and public health, and chronic disease management. The PRCHN and Associate Director Erika Trapl, PhD, are the anchor for the HEAL subcommittee. The PRCHN and its HIP-Cuyahoga partners have recruited and trained teams of residents from the REACH target census tracts to work within their own neighborhoods as Community Health Ambassadors to build health equity. These teams undergird every component of the REACH grant. More than 25% of adults aged 25 and older do not have a high school education. Learn more about HIP-Cuyahoga and the background of the REACH Initiative. Download a one-page information sheet on the REACH Initiative!